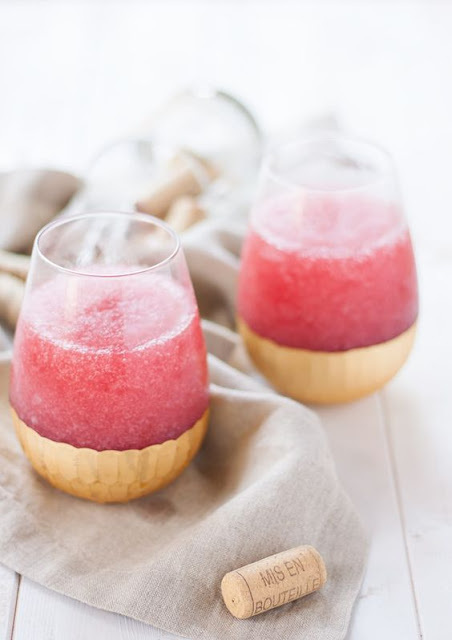 Frosé, frozé, frozen rosé: whatever you want to call it, I bet you didn’t even know you needed a frozen wine cocktail in your life until now. You do. It’s summer, so of course we’re already in the height of rosé season, but here in Charleston “summer” doesn’t quite cover the heat we experience. While much of the country is enjoying mid-to-high 80’s temps, we’re melting in 102 degree heat with humidity hovering around 98%, which sounds like it’s raining, but it’s not. Pour the wine into a large ( 13 x 9 or larger ) sheet pan ( Don't be an idiot -- obviously this pan needs to have lips so the wine stays in it ). Freeze for at least 6 hours. Add the strawberries to the water/sugar, and give it a solid stir. Let that mixture sit for around 30 minutes to infuse the simple syrup with the flavor of the strawberries. Strain the strawberry syrup through a sieve, but don't mash the strawberries through, just let it flow through naturally. Save the strained strawberries to put on some ice cream later, because that would be delicious. Oh, but the syrup: Chill the syrup for 30 minutes. The wine will still be slushy when it comes out of the freezer for the first time, due to the alcohol content. This is totally normal - do not be alarmed! 0 Response to "frozen rosé aka frosé"